Update December 15, 2016: Someone has been busy! This car has surfaced five and a half years later at Fantasy Junction with a comprehensive restoration and a $79,500 asking price. It’s satisfying when you see a car come full circle. Anyone know who did the restoration? Some things aren’t exactly to factory original – but a Veloce spec 1400cc engine build is a nice thing to have. Giulietta Spider 750D 1495*01594, 1315*41667. This lovely example is available now on eBay out of Illinois. These very early 750D’s are about as blue chip as a classic gets – they are mechanically simple, surprisingly fast, and can be quite reliable. As the description points out, this is a largely original example, without the usual “upgrades” such as a split case 5 speed, or disk brakes. As these cars continue to be discovered by collectors, originality to spec will hold more value. If you showed me this picture and said it was 40 years old I’d believe you except maybe it would have a bit of a sepia tone to it. Node looks really well balanced and straight – hard to achieve on a car that has seen any work. Giulietta Spider 750D 1495*00861, 1315*40850. This numbers matching Spider 750D, available now on eBay is from the end of the second year of production. In elegant white with red interior, it looks like a no nonsense well cared for example that is ready to be enjoyed. 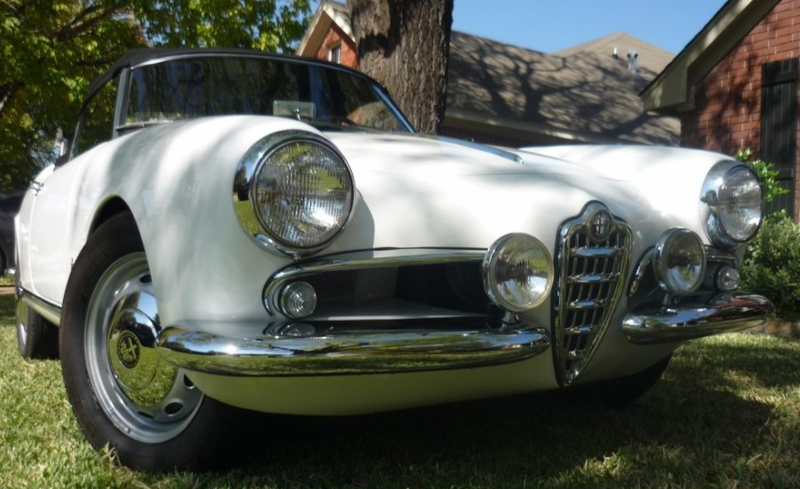 Buy it Now price of $77,500 is probably a tad more than most Alfa enthusiasts will want to pay for it, and I’d really like to see the engine compartment in body color at this price. Make an offer a few thousand less and get the engine compartment painted if it concerns you. Whoever at Alfa in the early 50’s was making the decisions about design and styling did an exceptional job. All the Giulietta models walk a line between universal appeal and no compromises beauty in a way that no other model line from any maker I can think of has. Spider 750D 1495*05489, AR00530*11182* (not original). This car recently received 31 bids and made $16,000 on eBay – but of course it is now relisted and receiving bids again. Visible rust indicates there will be a lot of repair needed, although the trunk floor is surprisingly good. It’s missing the transmission, front bumpers and center grill – none of which is particularly hard to find or expensive. This is a good project for someone who has done this sort of project before. Has the look of a parts car that someone realized was probably valuable in it’s own right. Nose looks decent. I’m going to guess the hood is not original. Spider 750D 1495*03800, 1315*43557. This Spider sold September 16th 2015 via a BringaTrailer (BaT) auction for $58,800. If I read their rules right, seller will see $58,550 of this – not too bad! Buyer pays 5%, up to a max of $5000 to BaT, making this a $61,700 purchase. Auction has no fixed end time -as long as there is a bid within 3 minutes of the last bid after the end date/time, it keeps going, and there is no fixed bid value increment – you can beat the last guy by a penny! Pretty cool. Handsome car this. Ready to be used and hopefully enjoyed. 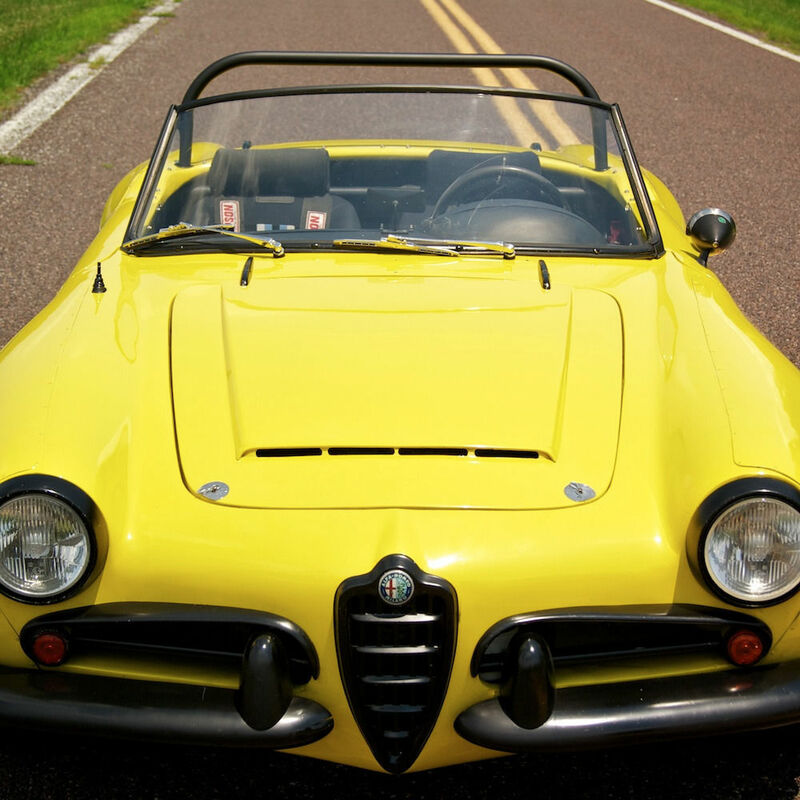 Update 8/18/2015: As yet finding it difficult to find a human whose tastes align with its character, this Giulietta Spider continues to float from mark-up to mark-up (I would have thought mark-down to mark-down -but who am I to speculate). Buy it now on eBay for $37,900 and be eschewed by Alfa owners, Cobra owners and those who aren’t comfortable in the presence of this much yellow. I mentioned in the last update that the clock was ticking toward a time when it would be an attractive value proposition to take this car back towards stock. That clock is still ticking. How hard could it be to lose the black? Giulietta Spider 750D 1495*01146, 1315*41158. Just ended today on eBay with 14 bids, the highest of which was $4051. It’s always sad to behold a car that is just plain beyond reasonable help. Judging by the level of completeness, it was probably parked with a leaky valve stem in 1969, and the battery drained before it could be fixed, then winter set in and you know the rest. 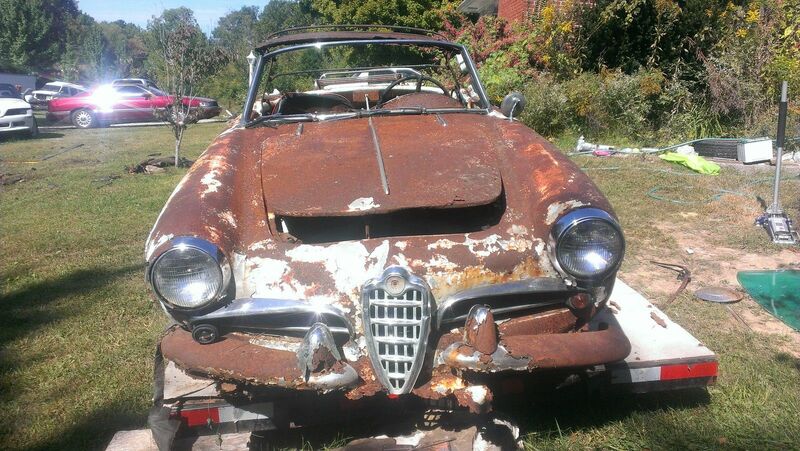 A 1956 model year Giulietta seems to carry slightly more ‘early model’ cache than a 1957, so perhaps someone with a donor body, or connection to inexpensive foreign skilled labor will decide this is worth having a go at. After all, this car restored to the standards a couple guys around the country can achieve is probably an $80,000 + car. Sorry for the order of the pictures, I’m still working out how the bulk media uploader works on my CMS.